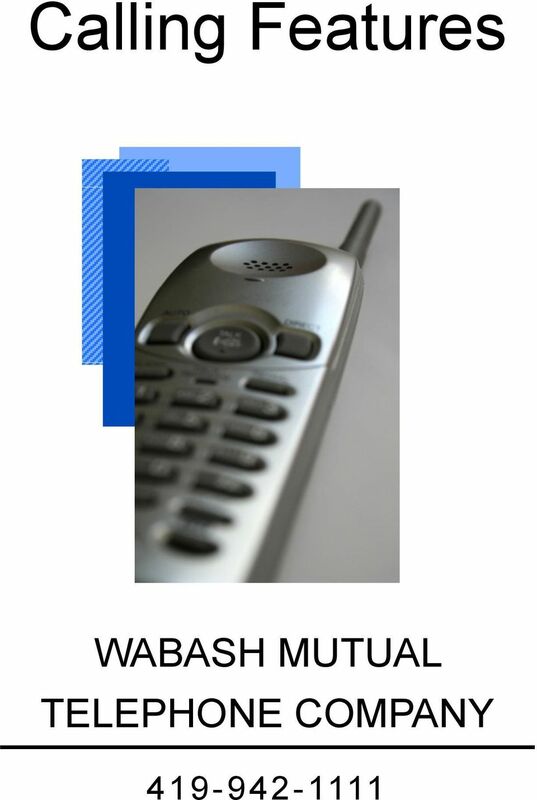 Download "Calling Features WABASH MUTUAL TELEPHONE COMPANY 419-942-1111"
4 CALL FORWARDING SELECTIVE $1.00 Allows you to select a list of calling numbers whose calls will automatically be forwarded. 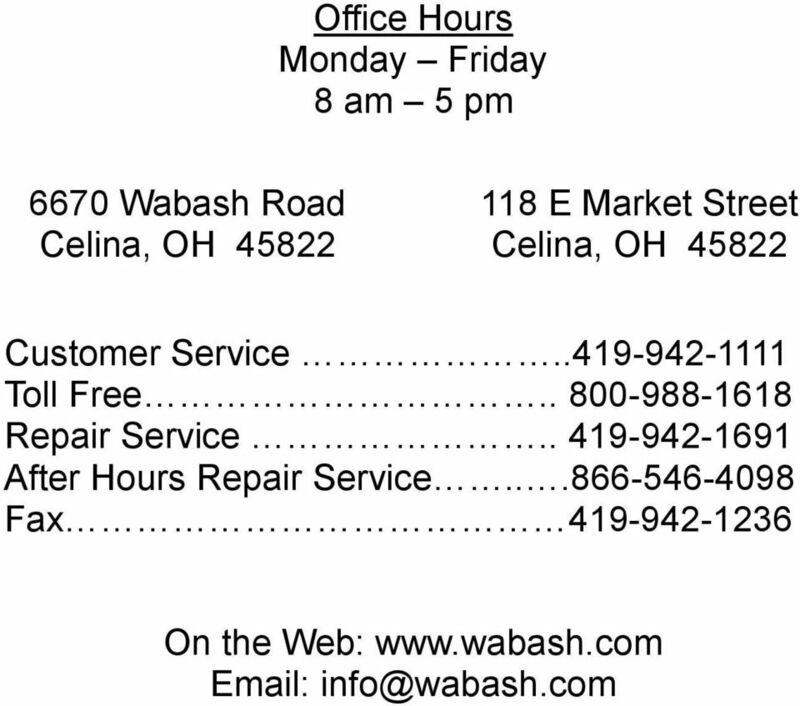 All calls from numbers on this list are forwarded on to a single alternative forwarding number. To configure, press *63 or *83 CALLER ID NAME & NUMBER $6.00 Displays the name and telephone number of the incoming caller on your telephone, if your phone has a Caller ID Display screen or Caller ID Display Unit. 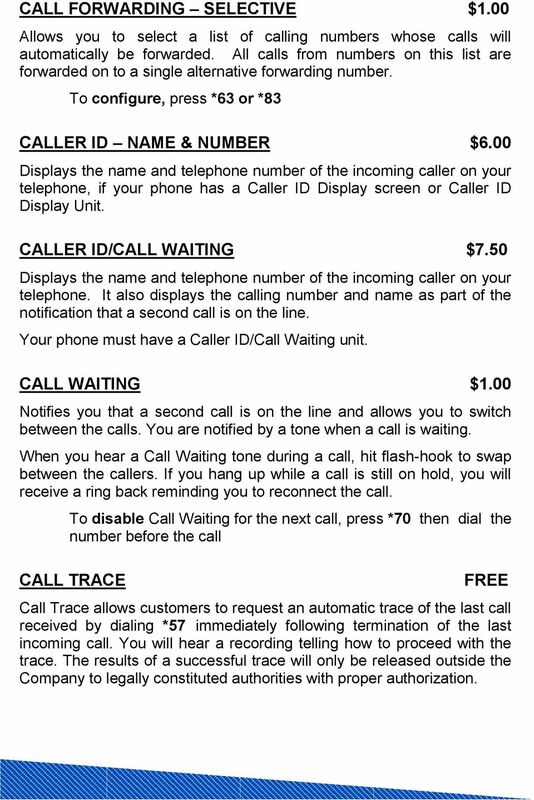 CALLER ID/CALL WAITING $7.50 Displays the name and telephone number of the incoming caller on your telephone. It also displays the calling number and name as part of the notification that a second call is on the line. Your phone must have a Caller ID/Call Waiting unit. 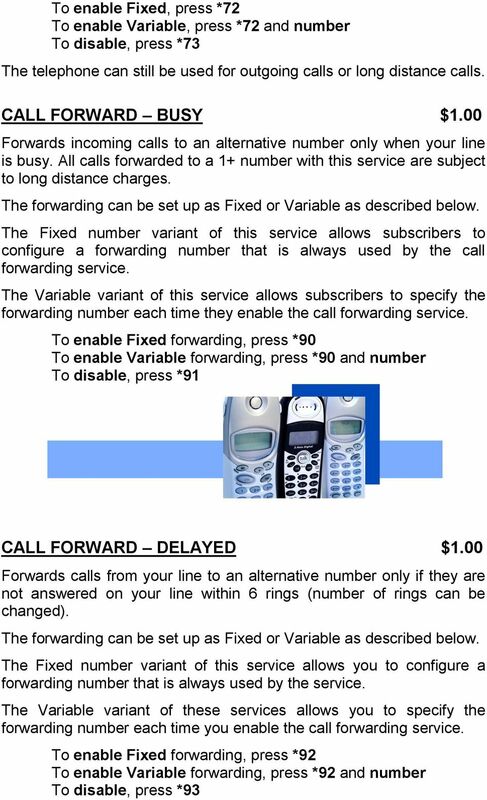 CALL WAITING $1.00 Notifies you that a second call is on the line and allows you to switch between the calls. You are notified by a tone when a call is waiting. When you hear a Call Waiting tone during a call, hit flash-hook to swap between the callers. If you hang up while a call is still on hold, you will receive a ring back reminding you to reconnect the call. To disable Call Waiting for the next call, press *70 then dial the number before the call CALL TRACE FREE Call Trace allows customers to request an automatic trace of the last call received by dialing *57 immediately following termination of the last incoming call. You will hear a recording telling how to proceed with the trace. The results of a successful trace will only be released outside the Company to legally constituted authorities with proper authorization. 5 CALL TRANSFER $0.50 Call Transfer allows you to call a another party while on an existing call, and then transfer the call to the second party. To transfer a call to the second party, hit flash-hook and dial the second number. You can choose to either hang up before or after the second number answers. The Call will then be transferred to their line. DO NOT DISTURB $1.00 This service allows you to block your line temporarily to prevent incoming calls. 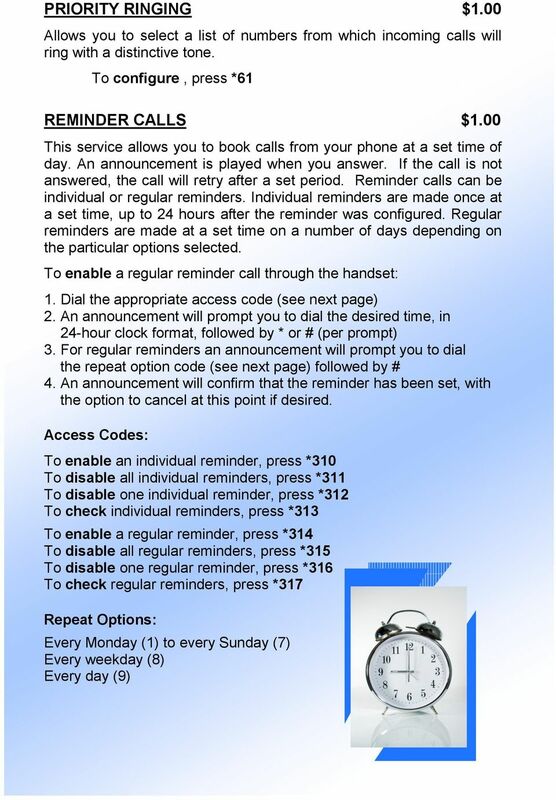 Outgoing calls can still be made as normal, but incoming calls are not connected; instead, the caller hears an announcement that your are not currently accepting calls. You can allow pre-configured numbers through by setting up Selective Call Acceptance. To enable, press *78 To disable, press *79 FIND-ME-FOLLOW-ME $2.00 This service allows you to set up additional numbers that will be called instead of or in addition to your own number, any of which can answer the call. A pre-defined order determines which number rings next. Once the call is answered, the ringing is stopped. Numbers will be set up through the office. 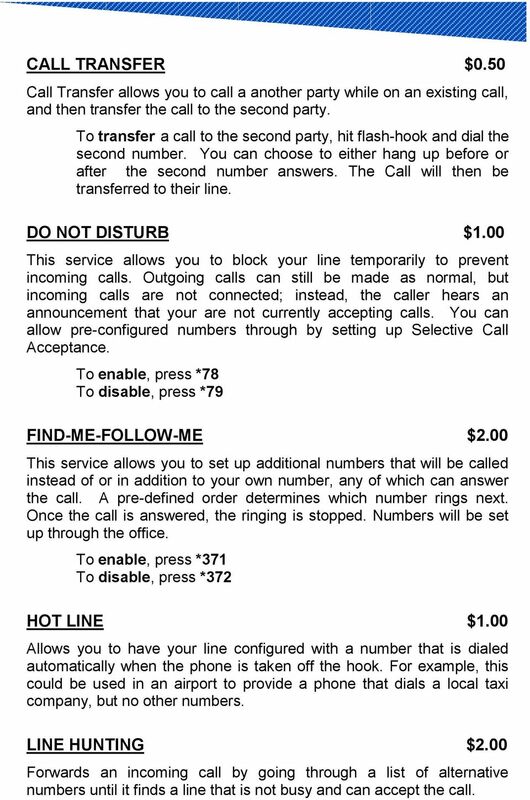 To enable, press *371 To disable, press *372 HOT LINE $1.00 Allows you to have your line configured with a number that is dialed automatically when the phone is taken off the hook. For example, this could be used in an airport to provide a phone that dials a local taxi company, but no other numbers. 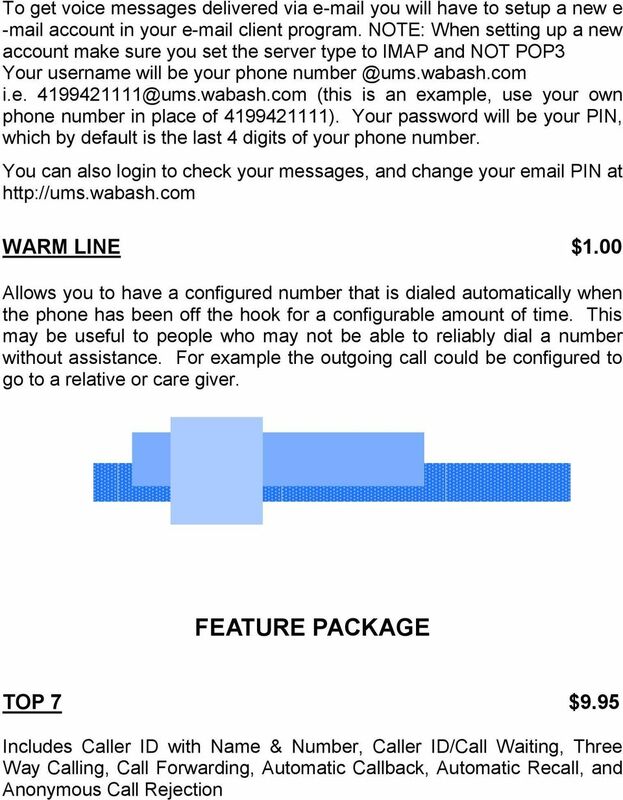 LINE HUNTING $2.00 Forwards an incoming call by going through a list of alternative numbers until it finds a line that is not busy and can accept the call. 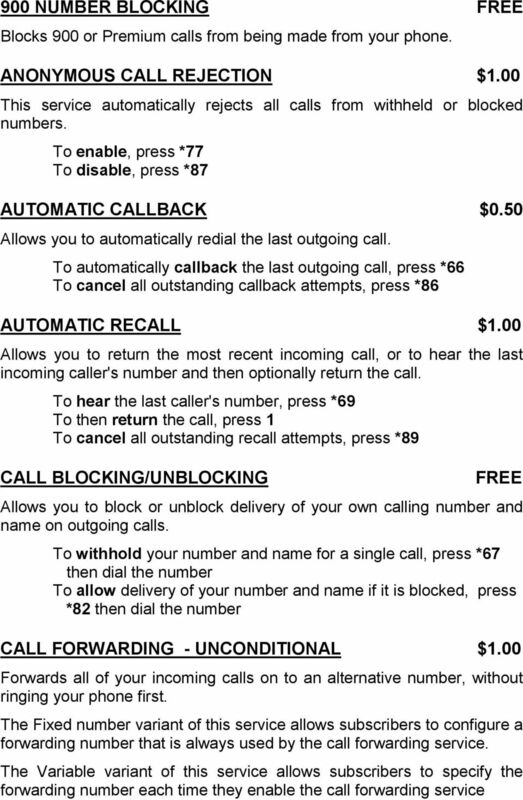 7 SELECTIVE CALL ACCEPTANCE $1.00 Allows you to block your line temporarily to prevent incoming calls, but to allow pre-configured numbers through. Outgoing calls can still be made as normal, but incoming calls from numbers that are not on your configured list are not connected; instead, the caller hears an announcement that the subscriber is not currently accepting calls. Must subscribe to Do Not Disturb Service in order for this to work. To access Selective Call Acceptance, press *64. SELECTIVE CALL REJECTION $1.00 Allows you to select a list of numbers from which incoming calls are automatically rejected. A rejection announcement is played to the calling party. 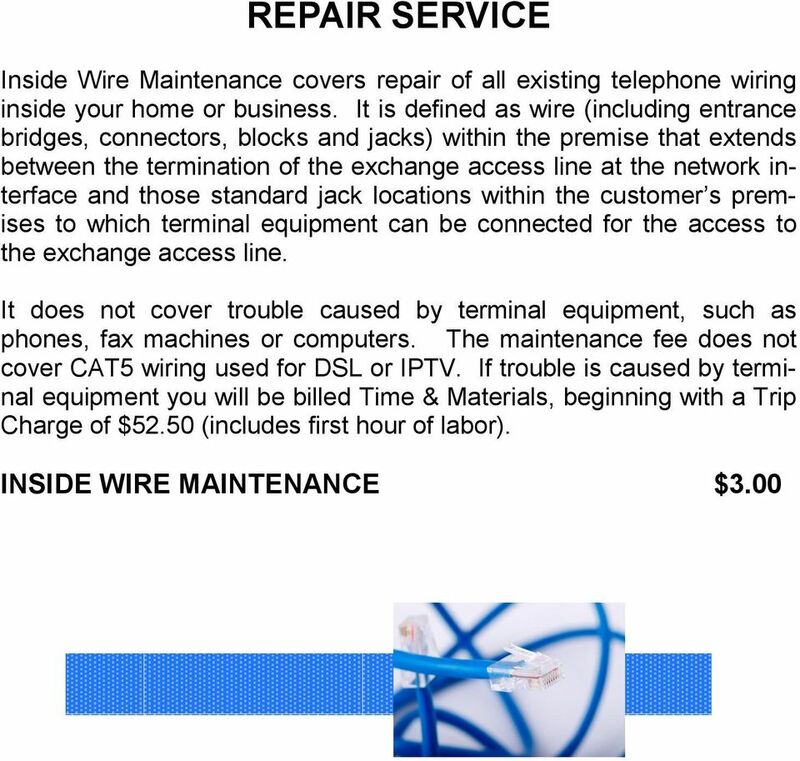 To configure press *60 or *80 SIMRING $1.00 This service allows your number to ring to one or more numbers at the same time, each of which can pick up. When voic is involved, the first voic to pick up will take the message. Numbers will be set up through the office. To enable, press *361 To disable, press *362 SPEED DIALING SHORT LIST - 8 $0.50 This service allows one-digit codes to be used as shortcuts for up to eight (8) selected phone numbers. The short codes have a one-digit range, 2-9. To use speed dialing, dial the short code and then either dial # or wait four seconds. To add a short number through the handset, Dial *74 Enter the one-digit short code, followed immediately by the number to which the short code maps. A confirmation tone is played. 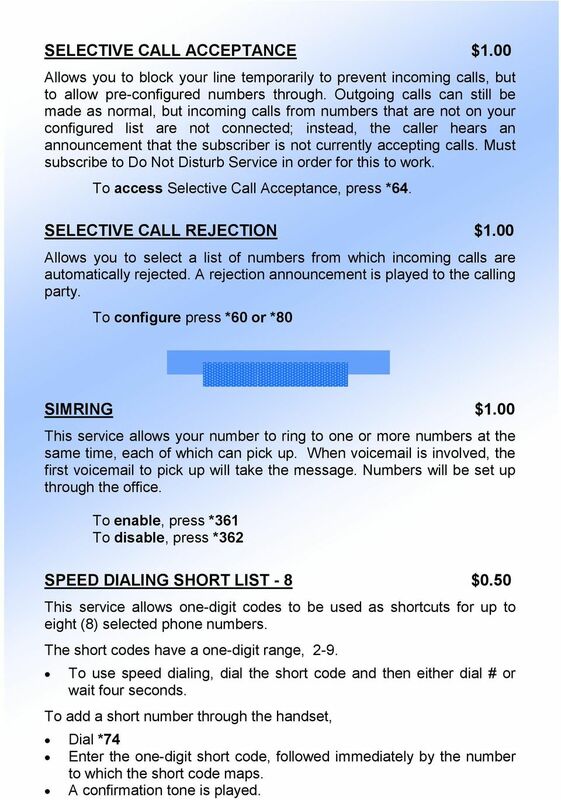 8 SPEED DIALING LONG LIST - 80 $0.75 This service allows two-digit codes to be used as shortcuts for selected phone numbers. The subscriber enters the code and this is interpreted as if he or she had dialed the phone number to which the short code maps. The short codes have a two-digit range. The defaults are To use speed dialing, dial the short code and then either dial # or wait four seconds. To add short code mapping through the handset, Dial *75 Enter the two-digit short code, followed immediately by the number to which the short code maps. A confirmation tone is played. 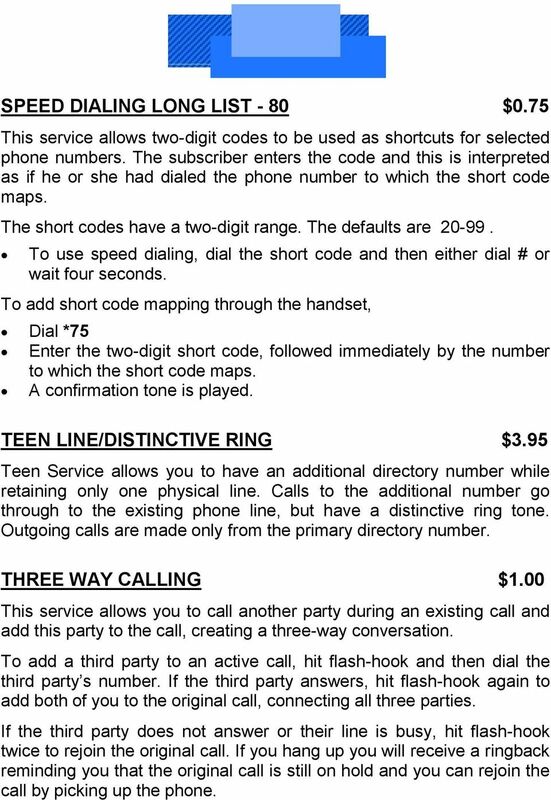 TEEN LINE/DISTINCTIVE RING $3.95 Teen Service allows you to have an additional directory number while retaining only one physical line. Calls to the additional number go through to the existing phone line, but have a distinctive ring tone. Outgoing calls are made only from the primary directory number. THREE WAY CALLING $1.00 This service allows you to call another party during an existing call and add this party to the call, creating a three-way conversation. To add a third party to an active call, hit flash-hook and then dial the third party s number. If the third party answers, hit flash-hook again to add both of you to the original call, connecting all three parties. If the third party does not answer or their line is busy, hit flash-hook twice to rejoin the original call. If you hang up you will receive a ringback reminding you that the original call is still on hold and you can rejoin the call by picking up the phone. 9 TOLL CONTROL WITH PIN $1.00 After dialing a toll number you will hear a stutter dial tone and must enter an account code before the call can be set up. When using toll control with PIN, if more than a specified number of incorrect attempts are made at entering an account code, an error message is played and the account is locked. Subscribers then cannot make any calls requiring an account code until the account is unlocked. The account can only be unlocked by the Phone Company. Pins can be 1-15 digits long. 1 Mailbox $3.95 VOIC 4 Mailbox $ Mailbox $8.95 Additional Mailboxes $2.00 each This service redirects unanswered or busy calls to a voic server. The calling party may leave messages on the server. The subscriber dials an access code to retrieve these messages. As well as unanswered or busy calls. From your home telephone, dial *15 then enter your PIN when prompted. Your PIN is the last 4 digits of your phone number and you will be able to change this. The first time you access your hosted voice mail, you will be required to change your PIN and also setup your voice mail greetings. Just follow the prompts. You can also check your voice mail from any telephone by dialing MAIL (6245). You will first be asked for your home telephone number, then your PIN. 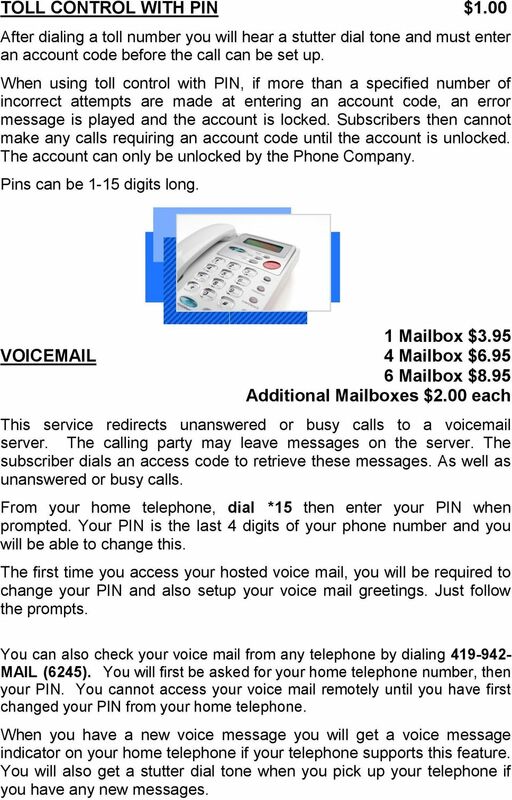 You cannot access your voice mail remotely until you have first changed your PIN from your home telephone. When you have a new voice message you will get a voice message indicator on your home telephone if your telephone supports this feature. You will also get a stutter dial tone when you pick up your telephone if you have any new messages. This feature will forward all calls placed to your telephone number to an alternate telephone number without ringing your telephone number. Call Forwarding No Answer Interrogation 1. Lift telephone handset. Press the assigned code (ex. *61*). Home Phone. Features Guide. Features Guide. Find out how to use the Home Phone call features. Voicemail 1571. Contents.